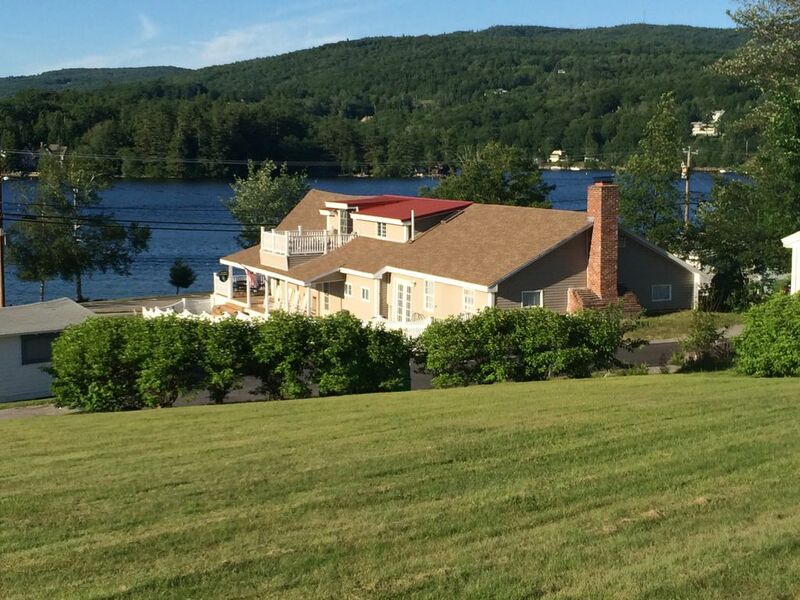 Lac-Neuve est souvent appelé «Best Kept Secret de New Hampshire 'Venez faire l'expérience dans l'accès privé / unité à l'étage de l'ancien hôtel de Rec Bungalo Village! Logement est l'étage 2 Chambre location de vacances sur l'ancien hôtel de Rec Salle / Salle de l'ancienne communauté Bungalo Village (aujourd'hui Newfound Sands). We rented the upstairs 2-bedroom unit which offers lovely lake views and convenient access - also is close to restaurants/shopping. There's a nice beach directly across the street. The home is part of a larger community of "bungalows" and has a lovely community feel. The traffic is a bit noisy, but is the trade-off for it's proximity to the lake. The upstairs 2-Bedroom is great for a couple or a family with younger children - and is above of a larger home (that can also be rented) on the first level. We really appreciated being able to bring our dog and things were set up well for that. The owner, Kevin, is very friendly and accommodating. Good find. The rental is what I'd hoped for. As a long time visitor to Newfound lake, I wanted a rental adjacent to Newfound Sands, to be close to the rest of my family. Staying in the former "rec hall" was special in that my children played there each year as youngsters. Kevin was very responsive to my questions/e-mails, the property had everything our family needed and was just the right space for my family. We loved the deck for morning coffee and nighttime viewing of the lake! Thank you Kevin for the chance to stay in your rental and for the comfort of your home. Quaint spot with amazing views of the lake from the deck. We ended up renting the whole space with a large group and my husband and 1 and 2 year old stayed in this space for the stay. We were able to bring in 2 port o cribs and set up for the kids to nap and sleep in. There is a small kitchen and a bathroom (with a tub) that was really just perfect for us in what we were looking for. Kevin was super knowledgeable and attentive in answering any questions we had. I’d definitley recommend this to others. I’m so glad you enjoyed your stay. The little ones (and any furry friends) is the exact reason we fenced in the yard for some added peace of mind while on vacation. We hope to see you come back next summer! My in-laws rented both upstairs and downstairs for a big family vacation. My husband and I stayed in the upstairs unit with our 3 children. This allowed us to have our own space but still be part of all the family activities. We also had our own little deck which we could sit out on at night after the kids went to sleep. Also having the lake directly across the street made it easy to go back and forth with the kids. The property was well maintained and great location. Highly recommend this property! Thank you Geri, we loved having you and definitely hope to see you return. Thanks for being the first to test out the new range. Keep in touch and have a great summer! We had such a great time staying at this property. The owner was friendly and easy to work with. The property was very clean and updated. Great views of the lake from the deck. The fenced in yard was perfect for our small dog. I would highly recommend this property. Juillet 2015 Bristol, NH Lac-Neuve était l'endroit vedette sur Chronicle Mystery WCVB les rues principales de télévision de diffusion! Cleaning fee is waived assuming cabin is left in broom swept / vacuumed condition.